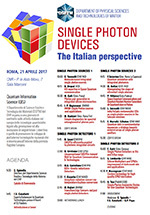 The Department of Physical Sciences and Technologies of Matter will organize a day focused on the Italian activities in the field of quantum technologies based on single photon generation and detection. The aim is to promote the development of National technological platforms in view of the future European Flagship. The event will take place on April the 21st in Rome, CNR Aula Marconi.